Simon Hruska (left) in action against Ivan Beynon. 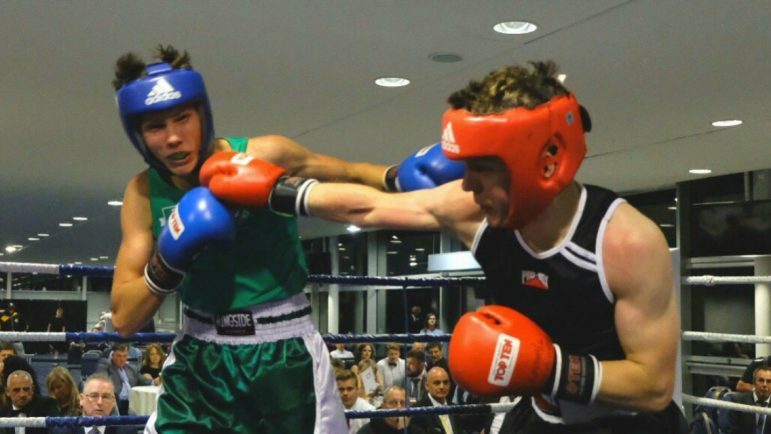 FITZPATRICK’S star Simon Hruska continued his development with a good bout against Ivan Beynon at Newbury Racecourse in Berkshire. Hruska took to the ring against the Thames Valley BC big-hitter and the first round exploded into life. Beynon landed some heave shots early on but to Hruska’s credit he took them well. This seemed to sharpen his mind and soon Hruska found his distance and range in what was a classic round of two halves. In the second round Hruska picked up from where he left off, using his distance and range to pip Beynon to the punches. Beynon then came out swinging in the third round but Hruska had now settled into a rhythm and boxed his way to a deserved victory.